1643—London, England: A painting on an the case of an organ by Christian Smith depicts a trombonist (see facing image; public domain) (Parrott, Grett and Solompne Singing). 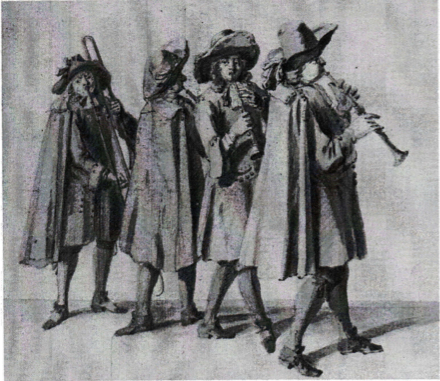 c. 1680—England: A wash drawing attributed to Marcellus Laroon depicts a group of 17th century town waits—3 shawms and a trombone (see facing image; public domain) (Herbert, Sackbut 77; Parrott, Grett and Solompne Singing). ← Google Analytics Update: 2,000-Plus Visits!